Yemen’s Houthi rebels said Sunday that a new UN peace plan was a “basis for discussion” despite containing “fundamental flaws”. The plan to end the country’s 19-month-old war is “a basis for discussion… but contains fundamental flaws in general, in the details and the timeframe,” the rebels said in a statement. They said the plan by UN envoy Ismail Ould Cheikh Ahmed did not include a “total, permanent ceasefire” or foresee lifting the blockade against areas they control. They said that they would put their objections to the UN envoy when he visits Sanaa in the coming days. The rebels and their allies — forces loyal to ex-president Ali Abdullah Saleh — are fighting forces loyal to the government of President Abedrabbo Mansour Hadi, who is backed by a Saudi-led coalition. The conflict has killed nearly 7,000 people since the coalition launched military operations in Yemen in March 2015, according to the United Nations. A previous round of peace talks held in Kuwait collapsed in August. Hadi rejected the peace proposal on Saturday, saying it “only opens a door towards more suffering and war and is not a map for peace”. The contents of the roadmap, which the envoy presented to the rebels on Tuesday, have not been made public. But informed sources say it calls for agreement on naming a new vice president after the rebels withdraw from Sanaa and other cities and hand over heavy weapons to a third party. Hadi would then transfer power to the vice president who would appoint a new prime minister to form a government in which the north and south of Yemen would have equal representation. Hadi said the new plan was an “explicit departure” from the UN Security Council’s resolution 2216, which calls on rebels to withdraw from territory they have captured since 2014. 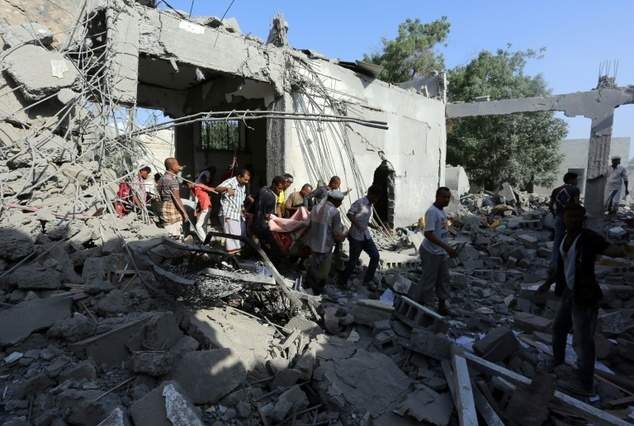 The Houthis demand an end to coalition air strikes. The conflict has caused a humanitarian crisis in the Arab world’s poorest country, displacing some three million Yemenis.